Pawcatuck, Conn. — Davis-Standard, LLC will promote the company’s full range of elastomer extrusion technology during the International Elastomer Conference, Booth #224, October 12-15 in Cleveland, Ohio. Davis-Standard will display its DSREV rubber extruder with a model 2000 crosshead and Uth rollex® 70 gear pump/strainer system with a two-roll feeder (TRF). Supporting control technology will also be shown. 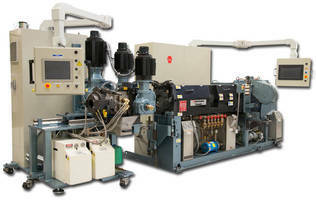 Davis-Standard recently installed a technical cell with this equipment at its facility in Pawcatuck to support processes ranging from hose, automotive seals and architectural gaskets to in-line straining and pressure stabilization applications. The DSREV extruder is Davis-Standard’s flagship design. It is a preconfigured machine with feedscrew and head zone direct injection temperature control units, a compact base, and simplified cooling and wiring systems. Other advantages include touch-screen controls, process data acquisition, and easily accessible machine components. The Model 2000 hydraulic crosshead reduces scrap and enables faster start-up times. The hydraulic actuation of the flow diverter/core tube enables quick tooling changes and simplified cleaning. All interior flow surfaces are coated with engineered formulations for better resistance and material flow. When this technology is coupled with the Uth gear pump, processors are able to isolate high pressure and achieve pressure stabilization. The gear pump is equipped with an Uth two-roll feeder (TRF) for cold feeding or to be used as a stand-alone device for fine mesh straining. Other gear pump advantages include improved filtration, reduced material retention time and a small footprint to easily integrate into existing lines. For more information prior to the show, contact Joe Wnuk at (860) 599-6309 or via e-mail at jwnuk@davis-standard.com. Davis-Standard, LLC (www.davis-standard.com), headquartered in Pawcatuck, Conn., is a global leader in the design, development and distribution of extrusion and converting technology. Davis-Standard systems encompass over 10 product lines to support manufacturing applications and customers within every major industry. This includes the agriculture, automotive, construction, healthcare, energy, electronics, food and beverage packaging, and retail industries, among others. With more than 850 employees worldwide and a network of independent sales agents and suppliers in nearly every country, Davis- Standard is committed to engineering equipment that is cost effective, environmentally friendly, and offers a high return on investment. The company has manufacturing and technical facilities in the United States, as well as subsidiaries with facilities in China, Germany and the United Kingdom.